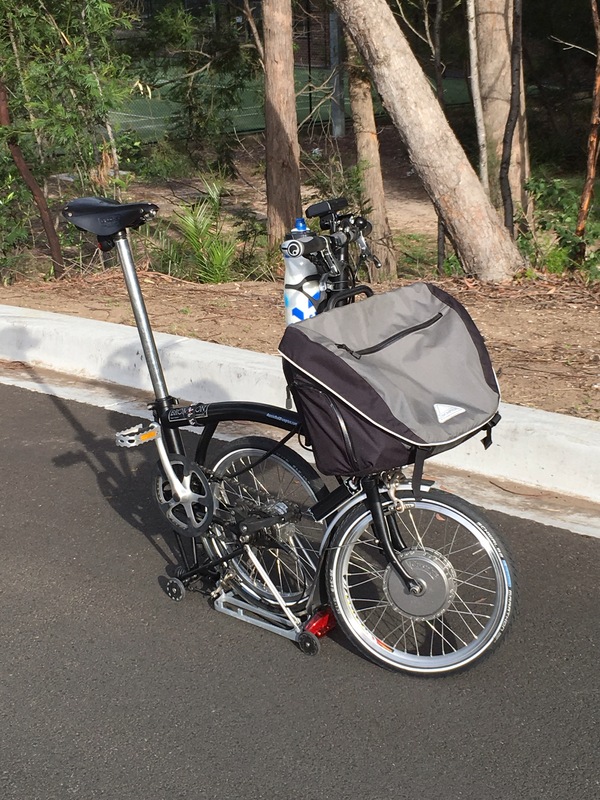 My previous blog post on “Electric patience” mentioned a coming electric conversion of one of my Bromptons, rather than wait out the eventual (?) release of a factory electric Brompton. What I’ve now got from Glow Worm Bicycles (thanks Ali, Maurice, Tim, Manny, et al) is possibly my ideal setup: a Pedelec Brompton, requiring that I still have to pedal everywhere but providing electric motor assistance for hills, etc. So far my little solo test riding has shown an enhancement to my “Brompton Grin” & I’m quite hopeful of comfortably keeping up with Mrs Aussie? We’ll see. I’m trying to be patient & any day/week now there should be a call? My patience for the electric Brompton has been frustrating, with so many rumours & release expectations. It’s been a constant for many years, as has my need for low geared bikes to provide assistance for riding with a heart condition. I can choose between six-speed Bromptons with 40T cranksets or an Alfine 11-speed with 44T but under some riding conditions I’m still struggling at walking pace. So the desire for a Pedelec Brompton (one that I still have to pedal to get electric motor assistance, rather than just push/twist a throttle) has been a hope for “normal cycling”. Will the electric Brompton dream eventuate? Recent news from Brompton on a likely introduction is the latest release info, but wasn’t very encouraging from my point of view. The Brompton announcement (http://www.brompton.com/News/Posts/2016/Electric-bike/) has expressed the release as “selected European cities in Summer 2017” (i.e. maybe July 2017?) but who knows when for the global market? Armed with some “UK-trip scuttlebut” & fresh research, I decided to check out local offerings for the possibility of a Brompton conversion. My initial findings weren’t very encouraging for obtaining a satisfactory product – but then I visited a shop where their conversions matched my quality & engineering expectations. At present I’m not going to mention the business name owing to various reasons – & Brompton restrictions? – but suffice to say they now have one of my Bromptons for conversion. Progress has been slower than I’d like due to workloads & component supply but really, everything is bearable in comparison to the alternatives? The conversion components are from Grin Technologies, a Canadian company that offers a Brompton kit (http://www.ebikes.ca/product-info/brompton-kit.html/) with various options; my choices to be revealed once my Brompton is completed. Fingers crossed for that call soon?